The Clemson Circle of Omicron Delta Kappa recently established an endowment in honor of President Emeritus James Barker during a recent ceremony. Shown here are (from left) Danielle Fredrich, Jonah Robison, James Barker, Taylor DeHart, Andrew DeMaria and Haley Fulton. CLEMSON – During this year’s Fall graduation ceremonies on Dec. 20, Clemson University’s most academically successful students will be wearing honor stoles over their gowns. Most people know that these stoles are a beautifully designed and well-deserved recognition of the hard work put in by students who have excelled in the classroom. But what most people might not know is that the profit made from the sale of these stoles benefits the campus and external organizations in a variety of ways, thanks to the hard work of a group of students who are members of the Clemson Circle of Omicron Delta Kappa (ODK). The group’s latest philanthropic accomplishment was the recent establishment of an endowed fellowship in honor of President Emeritus James Barker, who became an ODK member in 1989. The annual endowment, which will start at about $1,200, is the first of its kind to be funded by any ODK circle. Clemson’s ODK circle sells and distributes about 2,000 honor stoles each academic year. “This unanticipated recognition by Clemson students means a great deal to me because it will change the lives of future Clemson students,” Dr. Barker added. ODK, also referred to as the National Leadership Honor Society, was founded in 1914. The society recognizes achievement in scholarship; athletics; campus and community service; journalism, speech and the mass media; and creative and performing arts. The Clemson Circle, which currently has 75 members, organizes all aspects of the sale of about 2,000 stoles each academic year. It’s a complicated process that includes design, permission issues and distribution. The Clemson Circle of ODK circle also donates about $12,000 each semester to individuals and organizations on campus to support leadership development, events, Study Abroad, and any students who “want to do something out of their comfort zone that can make a difference not only for them but for the campus and greater Clemson community,” Robison said. Sales from the honor stoles benefit the campus and external organizations in a variety of ways. 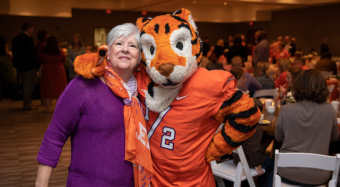 The Clemson organization is hoping to receive additional funds from ODK alumni so that it can broaden its efforts even further by creating additional scholarships and outreach. Omicron Delta Kappa, the National Leadership Honor Society, was founded Dec. 3, 1914 at Washington and Lee University in Lexington, Virginia by 15 student and faculty leaders. The founders formulated the idea that leadership of exceptional quality and versatility in college should be recognized, that representatives in all phases of college life should cooperate in worthwhile endeavors, and that outstanding students, faculty, and administrators should meet on a basis of mutual interest, understanding, and helpfulness. ODK was the first college honor society of a national scope to give recognition and honor for meritorious leadership and service in extracurricular activities and to encourage development of general campus citizenship. Since its founding, Omicron Delta Kappa has initiated over 300,000 members. Clemson’s Circle was founded April 13, 1987. Thirty members of the Circle are in the College of Science.